Inverse Property . . . fully explained . . . . There is a difference between an Inverse Property and an Inverse Operation . Each is explained separately, below. An Inverse Operation is a procedure in reverse . People use Inverse Operations all the time. An inverse operation "undoes" an original action . An inverse operation is the opposite of an original procedure. To illustrate, imagine looking up a phone number in the phone book. To begin, we generally look up a name alphabetically. The phone number is usually listed beside the name. Now imagine doing the exact opposite. Find a name by looking up the phone number. Find the phone number, and the name will be listed alongside. The process of beginning with a phone number and looking up the name is called an Inverse Operation. In this example, all of the numbers in the phone book have a name listed beside them. All of the names in the phone book have a phone number listed beside them. An inverse operation can be performed on any name or number listed. The concept of an Inverse Operation (a procedure in reverse) can be applied to many situations: directions on a map (going from point A to point B versus returning from point B to point A), mixtures (versus separation), any type of assembly such as building a car, swimming below the surface of a lake (versus ascending to the surface), making and then retracting a statement, putting on a jacket (versus taking it off), converting miles to kilometers (versus converting kilometers to miles), etc. Inverse Operations are valuable , and routinely used by everyone because an Inverse Operation gets you back to the point where you started . That is why inverse operations are so important when dealing with real numbers : an Inverse Operation reverses the effect of an operation (an operation is a procedure such as addition or multiplication) and gets you back to the number you started with. The inverse operation of addition is subtraction . The inverse operation of subtraction is addition. The inverse operation of multiplication is division . 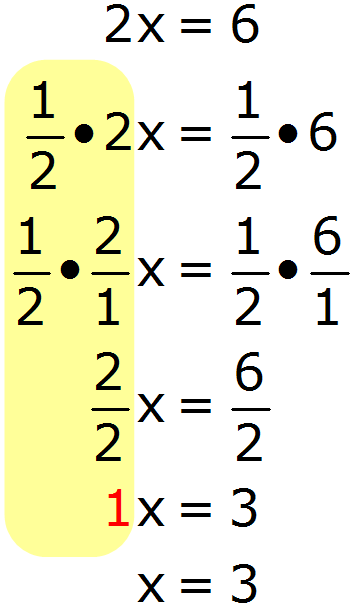 The inverse operation of division is multiplication. Inverse Operations are important keys to checking computations in arithmetic. Elementary school students are taught to check their computations using this principle. 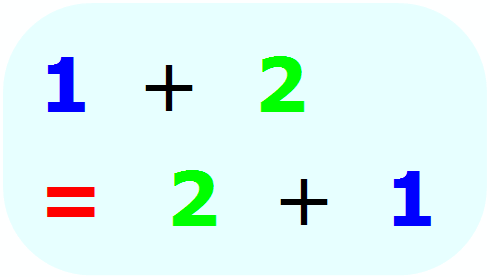 The "Inverse Operation" of addition reversed the subtraction, and returned the number we started with: the number 21 . This means that the original subtraction problem (21-15=6) was completed correctly. If it had not been completed correctly, the inverse operation would not have returned the number 21 (the original starting point). The "Inverse Operation" of multiplication reversed the division, and returned the number we started with: the number 312 . This means that the original division problem (312 ÷ 12 = 26) was completed correctly. If it had not been completed correctly, the inverse operation would not have returned the number 312 (the original starting point). The entire set of non-zero real numbers has the inverse property under addition and multiplication because every element in the set has an inverse. The additive inverse of any number is the same number with the opposite sign. When a number and its additive inverse are added to one another, the result is always 0 (zero) - the identity element for addition. The additive inverse of +15 is -15. The additive inverse of -66 is +66. The additive inverse of +X is -X. The multiplicative inverse of any number is the reciprocal of that number. When a number and its multiplicative inverse are multiplied by one another, the result is always 1 (one) - the identity element for multiplication. The multiplicative inverse of 15 is . The multiplicative inverse of -66 is . The multiplicative inverse of X is . Inverse Properties are important keys which can be used to simplify equations. To eliminate the +3, the additive inverse property of -3 can be used . . . because +3 - 3 = 0 (the additive identity element). Add the additive inverse of -3 to each side of the equation. 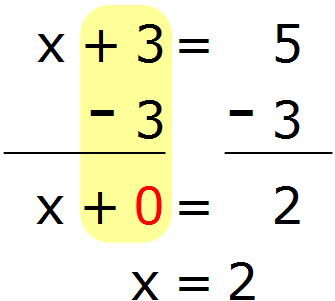 To eliminate the +2 (of the 2X), the multiplicative inverse property (of the number 2) of ½ can be used . . . because (2) * ( ½ ) = 1 (the multiplicative identity element). Multiply each side of the equation by the multiplicative inverse of ½ .